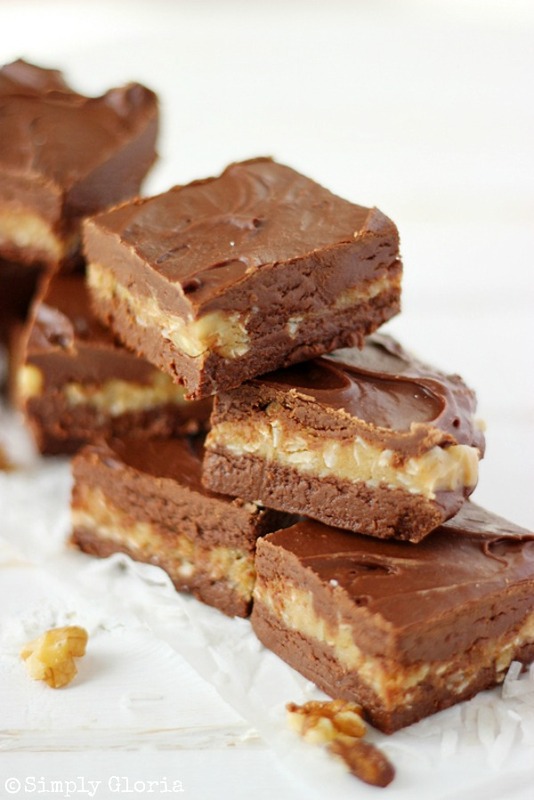 A sweet, caramely mix of nuts and coconut in the middle of creamy, decadent fudge. German Chocolate Fudge is the perfect chocolate fix for your summer chocolate craving! Did you know today is National Fudge Day?! Most of us cherish the special fudge making moments in the middle of winter, during the holidays. But, when you think about it…. fudge is one of the easiest sweet treats to make on a hot summer day! There’s no turning on an oven to make this special chocolaty treat. German Chocolate Fudge has such a divine texture AND taste! One bite and you’ll be in LOVE with the delectable creamy chocolate encircling a nutty caramely coconut center. This idea came about when Father’s Day was approaching, and all the men in my life (my boys and their dads) LOVE German Chocolate anything. Although, the whole cake thing was not going to happen. Was not in the cake baking kind of mood at that moment. I wanted something fast… and easy. So, the German Chocolate Fudge was in the making. I wanted the same caramely texture that you’d find in a traditional German Chocolate cake. But, all in the middle of creamy fudge. I was off to create and test the few pounds of chocolate in my science kitchen. Needless to say, it came out a winner! The texture (and taste) came out exactly how I envisioned in my mind… sometimes in my dreams. This German Chocolate Fudge is loved by not just the men in my life… but the mail lady and the kids in the neighborhood, too! 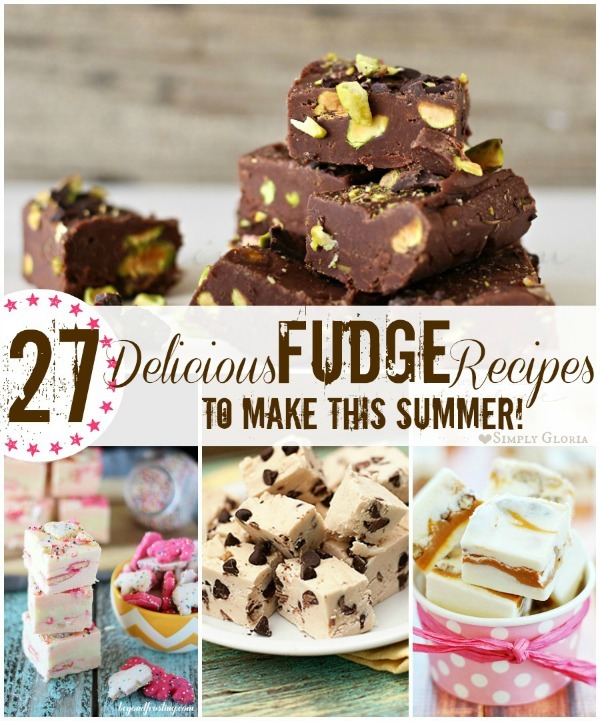 Hope you have lots of fun making and eating FUDGE this summer! Begin with making the filling. In a small heavy sauce pan, bring 1/3 cup evaporated milk, 2/3 cup light brown sugar, butter, and 1 teaspoon vanilla to a medium-high boil for 6 minutes. stir constantly, as to not burn. Turn off heat and stir in 1/2 cup mini marshmallows until all has melted. Add shredded coconut and your choice of chopped nuts. Stir and set aside. For the fudge, bring 2/3 cup evaporated milk, 1 2/3 cup granulated sugar, 1 teaspoon vanilla, and salt to a boil over medium heat. Cook for 4 minutes, stir constantly. Remove from heat. Pour over marshmallows and white chocolate in a large mixing bowl. Stir until all combined and the chocolate chips and marshmallows are melted. Drop small spoonfuls of the coconut and nut filling onto the top of the fudge. Do not spread. There will be enough to drop on all parts of the fudge. Pour the rest of the fudge mixture on top of the filling. Lightly and evenly spread the fudge mixture on top of the filling. The fudge mixture will immediately start to cool. Set into the refrigerator for 30 minutes or longer before cutting. Enjoy! Store in refrigerator covered with plastic wrap, for up to 7 days. Makes about 16 large cut pieces or about 2 dozen small cut pieces. Celebrate National Fudge Day with a whole lot of other fudge recipes I gathered up and shared with my dear, sweet friend, Gina over at Kleinworth & Co.! « Beat The Heat $300 Giveaway! I didn’t know it was National Fudge Day, but I’ll tell you this would be my favorite fudge of all time! German chocolate cake is my favorite, and this looks delicious with that coconut pecan layer. Pinning! So happy you love this creation, Marcie! You’re definitely going to have to give this a try! Scrumptious!!!!!!!!!!!!! Oh my goodness!!! (LOVE that the posts are linked together too) Awesome! It’s a day of fudgy celebrations, my friend! <3 Thank you for having me today! Wow, this looks delicious! I hardly ever make fudge, I think I forget how easy it is. Either that or I know I can eat it all by myself. 😀 I love the shredded coconut center. Pinning! You are hilarious, Eric! That sounds like a lot of fun! You better post pics of your fun adventure! Thank you, Medeja! It is really divine! Fudge is a weakness of mine. It’s like when I’m near it I can’t think of anything else! So I’m totally loving this recipe! YUM! Pamela, you are too funny! I get the same way, too! Oh. My. Word!! This looks amazing!! Pinning this so I can make it soon! My Mom got me hooked on german chocolate cake when I was little, and I’ve loved it ever since! Coconut, chocolate, what’s not to love?! Love those two together… chocolate and coconut! Thanks so much, Nicole! I have officially dubbed thee “Sweet Treat Queen”! Love how creative you are with everything and that you know like everything food holiday! Wealth of knowledge you are! 🙂 Beautiful photos as always sweet friend! 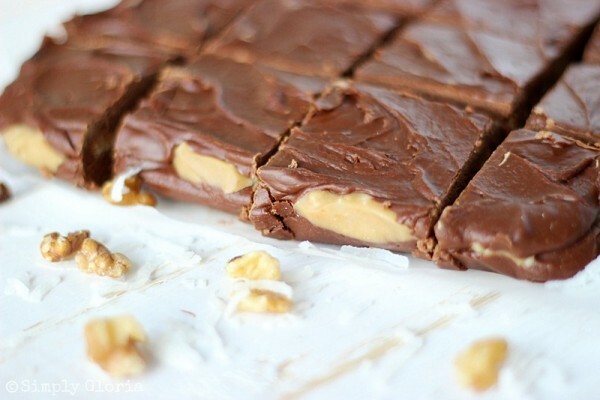 This fudge look down right amazing!! Wow, I love German chocolate cake so making this into fudge is pure genius Gloria! These pictures are gorgeous! 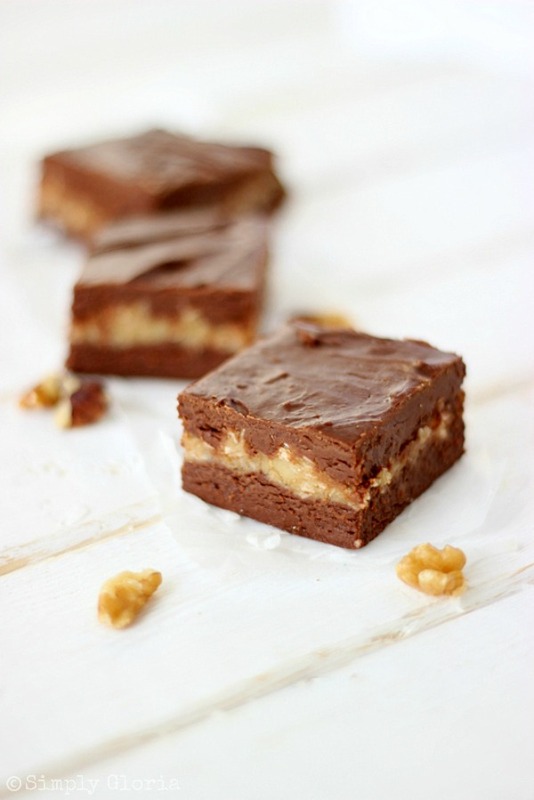 Totally making me drool and wishing I had some of this yummy fudge in front of me for real – yum! Now this is divine. Let’s just take a moment to appreciate this. I’m back. Seriously, this is a fudge recipe! 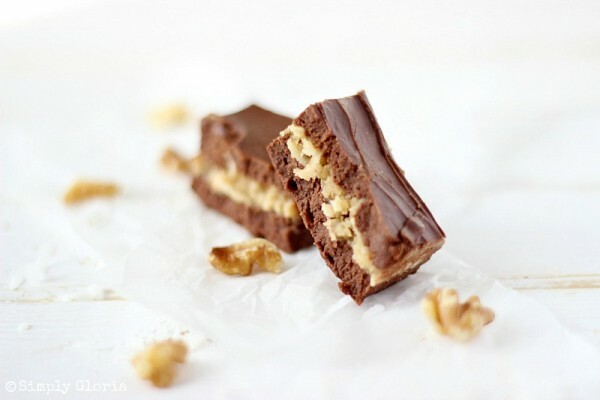 The chocolate and caramel and nuts in those pretty layers are almost too much, Gloria! Pinning! Oh wow, IU’m craving these, they look amazing! Thank you for sharing! I’m keeping this recipe! 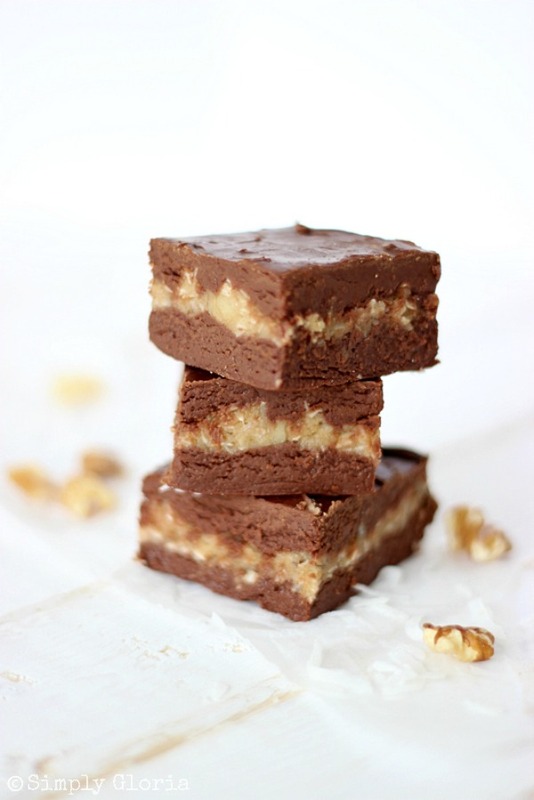 I wish I didn’t miss National Fudge Day – good thing I don’t need a special day or occasion to make fudge though :). I would love to reach through the screen and grab a couple of pieces of this chocolaty goodness. Yum!! Oh my gosh this looks so delicious! Thank you for sharing at The Wednesday Round Up! We hope to see you back next week! Your fudge looks so beautiful! Great photography. Would love for you to share this at the Wonderful Wednesday Blog Hop so I can feature it. Yum!!! So pretty and creative. I think this would be perfect for a bake sale. Mallory, what a great idea! Shutta front door…and give me that fudge! Yum! This fudge has my name written ALL over it! I love German Chocolate! Who knew they had a holiday for fudge?! Apparently you did!!! 😀 German Chocolate Fudge is genius, Gloria!! Pinning for sure! Thank you so much, Jamie! I think the food holidays are just a bigger excuse to chow down on something and celebrate… lol! My hubby loves anything “German-chocolate”. will defiantly need to try these yummy looking morsels! Have a great weekend!!! This sounds really good! Can’t wait to try it – pinning to my Chocolate recipe board. Oh man, how did I miss National Fudge Day? I can’t wait to try this version. Pinned! Oh my goodness, you’re making me drool! Thanks for sharing the recipe, it looks amazing! Oooh, I just love fudge! This is such a great idea with all the different flavors and textures. This looks amazing, Gloria!! 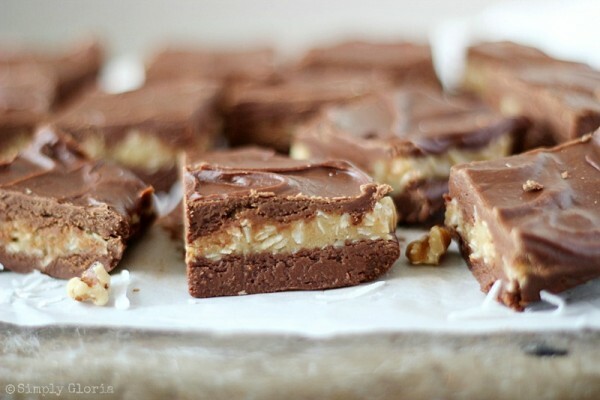 I love chocolate and coconut together, and your photos make this fudge look irresistible. Can’t wait to try it! Andi @ The Weary Chef recently posted…Saturday Night Fever #39: Featuring Shrimp, Grapefruit, and Strawberries! 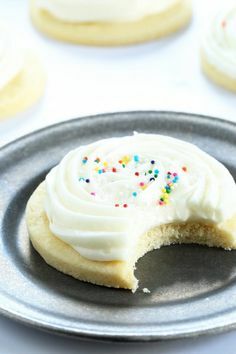 These look SO delish, Gloria! Your website is so much fun! You do such a great job with your recipes and posts! Happy to share this post with my followers and to share some bloglovin love! I always miss out on these cool food holidays. I could eat a whole batch of fudge in one sitting. This fudge looks decadent and delicious. This fudge looks downright heavenly Gloria! Pinned! You had me at German Chocolate! This fudge sounds amazing!